* Legroom Height to keyboard: 24"
* Height from bottom shelf to Keyboard shelf: 18"
* Internal Width: 21.75 "
* External Width (wall to wall, w/o tabletop): 23"
A true elegant space saving computer table. Only 19" deep. 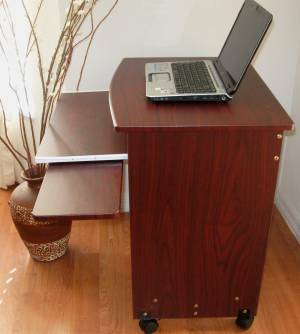 A very compact and shallow desk, with a sliding keyboard shelf, and a sliding mouse tray that slides to the left or right side. The pull-out keyboard shelf creates generous leg space. The sides help hiding the cables. 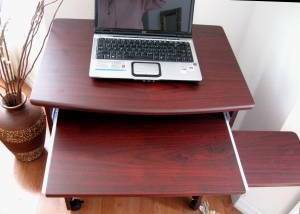 Use this computer desk either as a desktop computer desk or a laptop desk. When used for a notebook computer, the laptop is generally placed in the top shelf. The sliding keyboard shelf is used for writing space or for literature. 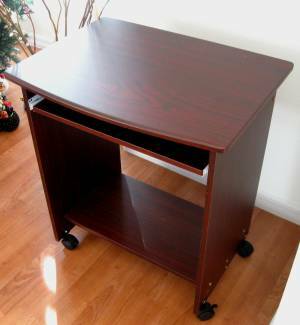 This versatile compact computer cart, is small enough to be used in any room, or simply to add it next to any table or desk to create a L-shape type of desk layout. 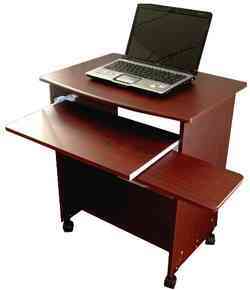 It is also used in all types of businesses as an easy an affordable way to add an extra computer station.